31 August 2015, at 1:00a.m. The aim of this guide from the Irish Sea Fisheries Board (BIM) is to provide practical and contemporary guidelines on the handling and quality of brill, turbot and halibut at all stages, from capture to the first point of sale. Optimal handling and storage practices at sea and ashore are essential elements in the management of fish quality and the achievement of maximum return on national and international markets. Defining fish quality, however, is not easy. The process includes the understanding and assessment of a range of factors, many of which depend on market preferences such as: species, size, capture method, seasonal condition and freshness. Freshness, describes the degree of spoilage a fish has undergone since capture and is an important indicator for consumers. Very importantly, and unlike many other quality attributes, this is an area within the management of the catch, over which the fishing industry exerts significant control. Sensory assessment remains the most popular method of assessing freshness. This type of assessment uses smell, texture and visual appearance to determine the quality of fish. It is a particularly useful technique as it is low cost and requires nothing other than careful and exact training. It is a widespread and reliable assessment method and provides the foundation for the design and application of this guide. Brill, halibut and turbot are grouped together, in this guide, as they have similar handling requirements. 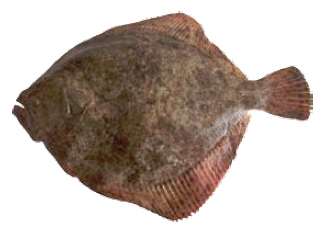 Brill are a very large, broad bodied, left-eyed flatfish. They are usually a sandy brown to olive green colour, with dark and light spots. The underside is creamy-white. Halibut are the largest of the flatfish and are righteyed. They are usually a chocolate to olive or slaty brown colour. The underside is pure white but can be blotched, clouded or grey. 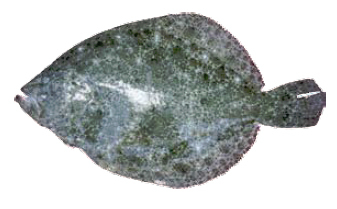 Turbot are an almost circular bodied, left-eyed flatfish. The upper surface is usually a sandy brown to grey colour and is studded with numerous bony knobs, or tubercles. They are usually a sandy brown to grey colour. The underside is creamy-white. In addition to correct handling, a high standard of hygiene and cleaning is essential to ensure production of a safe, high quality, seafood product. After every haul, the deck, hopper, boxes, gutting area, knives, oilskins, aprons and all other equipment, should be washed down with seawater to remove fish blood, scales, offal, dirt and any other fouling substances. 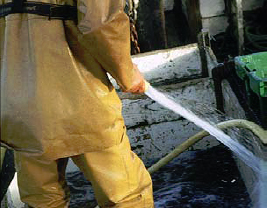 At the end of every trip, the deck, fish hold, hoppers, boxes, gutting area, knives, oilskins, aprons and other equipment, should be washed down using a power hose and detergent to remove fish blood, scales, offal, dirt and any other fouling substances. A chlorine-based bleach should be used to thoroughly clean working areas and equipment, and inhibit any bacterial growth. 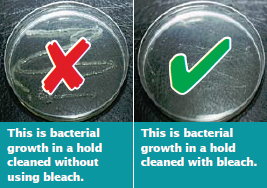 To show the importance of this, sample swabs were taken from a hold of a boat where no bleach was used and from a hold of a boat where bleach was used. Under laboratory conditions bacterial growth was greater on the sample swab from the deck where no bleach was used. All residual bleach should be rinsed away with clean seawater. Detergents and sanitizing agents should be from the approved list issued by the Sea-Fisheries Protection Authority (SFPA) and should be used to the product specifications.